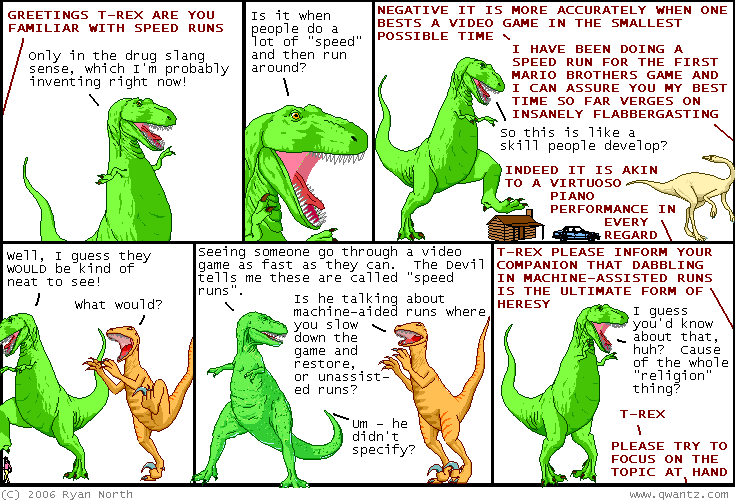 Dinosaur Comics - April 19th, 2006 - awesome fun times! April 19th, 2006: The Dinosaur Comics books have come in and they are 1000 books of beauty. Pre-orders are being shipped and you can order your own copy by clicking on the link and paying some money! The comics include some text beneath each comic that is hidden on the website, so there is ONE MORE REASON to order the book! If you'd like to get your comic store to carry the book, that would be sweet. You can give them the book's ISBN number, which is 0-7560-0518-3. I also updated the Webcomic Tattoos page with a new Achewood tattoo!